Drilling for oil is risky business whether in Utah or anywhere else in the world. Companies or individual prospectors drill a wildcat well in the hope of finding a new field or oil reservoir. Typically one or two new discoveries will be made for every 10 wells drilled, or a 10 to 20 percent success rate. Once a new oil field is discovered, development wells are usually drilled to extract the oil. Although the success rate of development wells is generally higher (about 80 percent), both natural resources and money can be lost if the field is not properly developed. If too few wells are drilled, large amounts of oil will be left in the ground, but drilling too many wells is expensive and can result in a financial loss to the company. Therefore, an important aspect in the development of any oil field is to determine the minimum number of wells needed to economically (price of oil versus cost of drilling and producing a well) produce the maximum amount of oil. 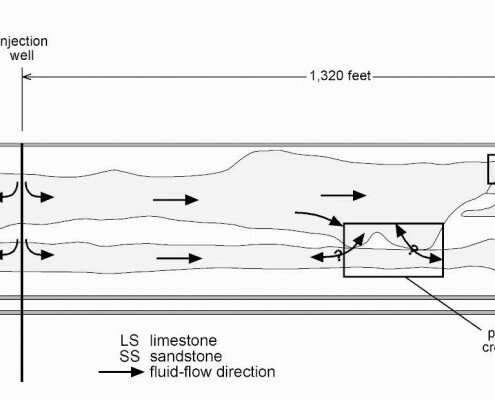 One method to help determine the number of wells needed to economically extract oil from a reservoir is to study the reservoir rock where it is exposed at the surface, typically many miles from where the rock produces in the subsurface. Geologists can develop models of how the oil and water might move through the rock by observing how the reservoir rock changes (the reservoir heterogeneity) vertically and horizontally on the outcrop. The model can be used to simulate fluid flow and well production under different scenarios to determine the most efficient spacing (distance between wells). 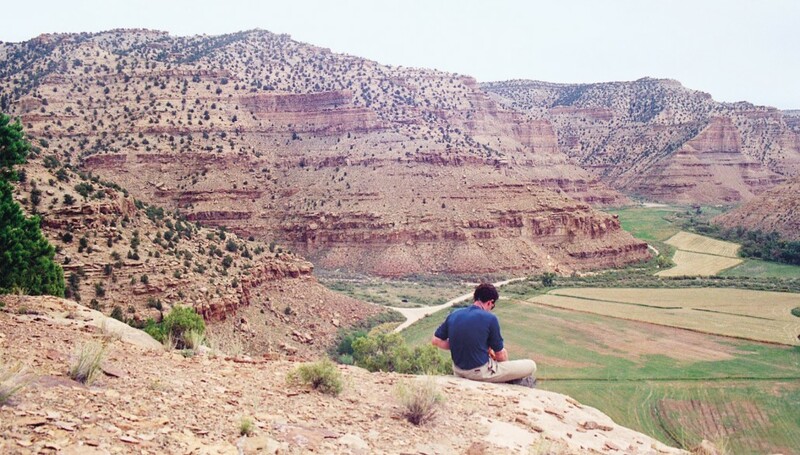 In the Uinta Basin of northeastern Utah, the Utah Geological Survey (UGS) is studying the reservoir characteristics of the Green River Formation in the subsurface and where the rocks are exposed at the surface. One aspect of the study is to model the reservoir heterogeneity over a distance equal to the distance between wells in the Monument Butte area (1,320 feet). 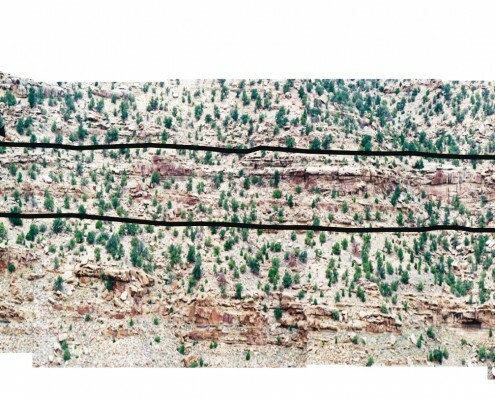 To do this, the UGS studied a 100-foot-thick, 2,000-foot-long section of the Green River as exposed along Nine Mile Canyon, northeast of Price, referred to as the Nutter’s Ranch study site. 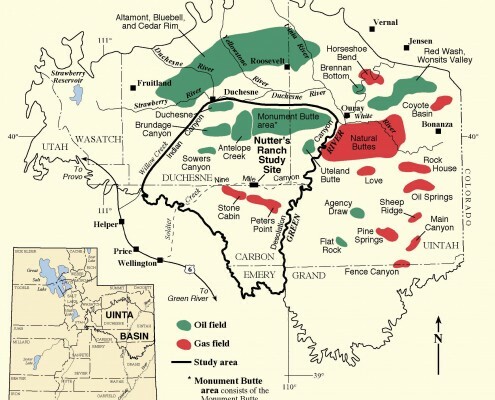 More than 700 wells in the Monument Butte area of the Uinta Basin are producing oil, or injecting water to help produce oil, from the Eocene Green River Formation at a drill depth of about 5,500 feet. In this area, oil companies typically drill one well in the center of each 40-acre tract, resulting in 16 wells per square mile with 1,320 feet between wells. In a group of 16 wells, every other well will be used to produce oil and the wells in between are used to inject water in a process known as water flooding. Water injected into the sandstone reservoir rock pushes the oil towards the producing wells. The Green River Formation consists of thousands of feet of interbedded sandstone, limestone, and mudstone that were deposited along, or near, the shore of ancient Lake Uinta. The lake occupied the present-day Uinta Basin between 55 and 45 million years ago. The shoreline and depth of Lake Uinta were constantly changing, resulting in a complex vertical and lateral mix of deposits. 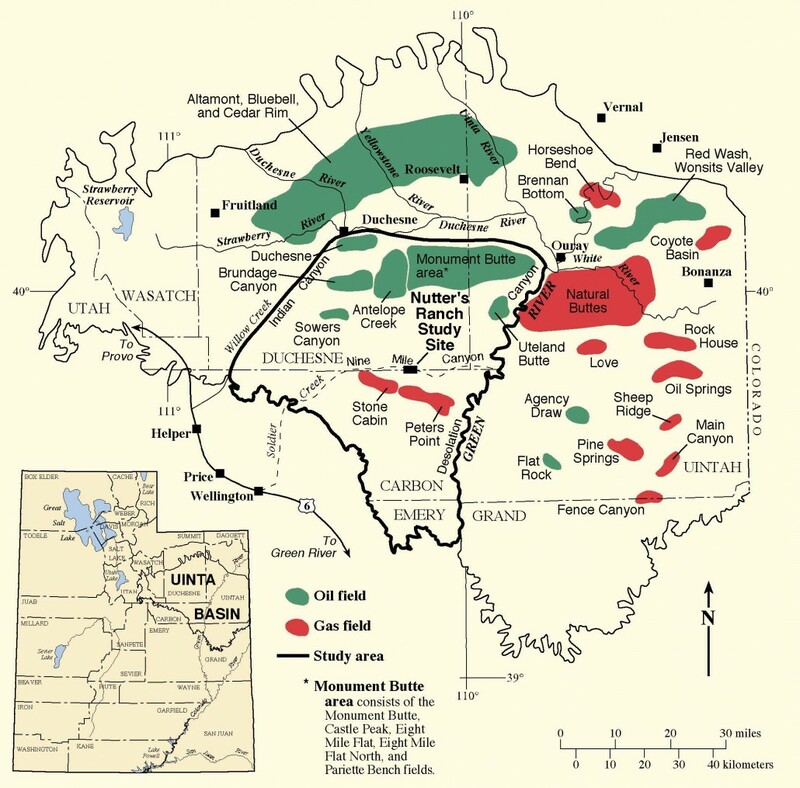 Channel and shallow-lake sandstone deposits are the primary oil reservoirs. The oil is derived from organic-rich mudstone that was deposited in deeper parts of the lake. The Nutter’s Ranch study site contains a typical mix of sandstone, limestone, and mudstone. The Nutter’s Ranch study site was photographed, vertical sections were measured and described, and individual bed boundaries were field checked and mapped on a photomontage. Two imaginary wells 1,320 feet apart were “drilled” through the two-dimensional representation of the study site. 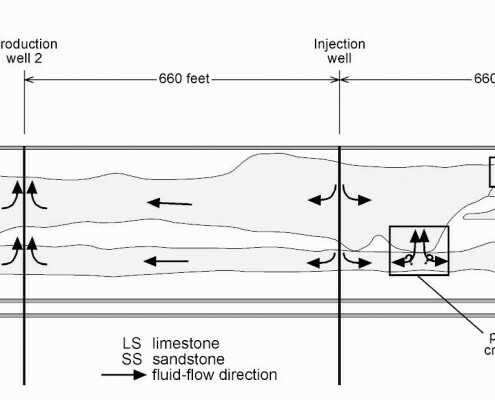 Both “wells” encounter, from top to bottom, a limestone bed, two reservoir-type sandstone beds with interbedded mudstone, a very thin sandstone, a mudstone, and a limestone bed. Using just the well data, the simplest interpretation is that the reservoir rocks are continuous between the two wells. However, significant reservoir heterogeneity exists between the two wells based on the outcrop observations. The upper sandstone bed is actually two beds with different internal features that may not allow fluid to flow between them (a barrier) if they were in the subsurface. The lower sandstone bed is nearly cut out by a middle sandstone bed that is not penetrated by either well. Oil in the middle bed may not be “produced” at all. 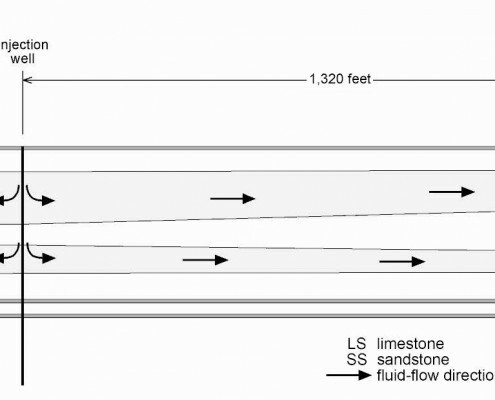 In a few places the upper sandstone bed is in contact with the lower sandstone bed, which could complicate the fluid flow pattern by creating cross flow between the beds. The fluid-flow pattern can change significantly with different well placements and by changing the spacing between wells. The fluid flow scenarios become even more complicated if one sandstone bed contains oil and the other bed contains water. Expand the geological and fluid-flow model to the third dimension to represent an actual field-size reservoir, a quarter square mile for example. Calculate the increased oil recovered by drilling wells 660 feet apart instead of 1,320 feet apart. Calculate the value of the increased oil production versus the cost of drilling, completing, and producing the additional wells, based on an estimated range of oil prices and costs. For more information about the Green River Formation study visit www.ugs.state.ut.us/greenriver/gree nriv.htm or at geology.utah.gov/emp /greenriver/index.html. 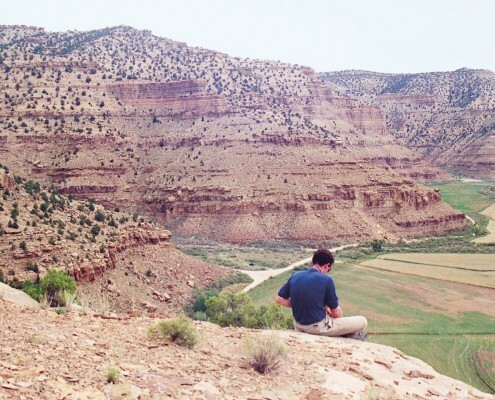 The study of the Green River Formation is part of a three-year project entitled Reservoir Characterization of the Lower Green River Formation, Southwest Uinta Basin. The study is partially funded by the U.S. Department of Energy (DOE) National Petroleum Technology Office in Tulsa, Oklahoma under the Fundamental Geoscience for Reservoir Characterization program, Virginia Weyland (DOE) contract manager.